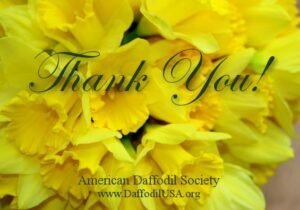 If you live in the U.S, and are planning to register a daffodil name this year, you need to get your registration forms to me by June 15, for forwarding to the RHS by June 30. If you need a form, email me at and I’ll send you one. You can send the completed forms to me as email attachments. A photo is not necessary for the RHS, but it would be nice to have one for them as well as for DaffSeek. Digital is preferred. If you have sent your forms directly to the RHS, please send me a list of names and classifications so that they can be included in the December Journal with the list of American registrations for the year.